If you have any special needs, questions, or concerns please tell us here. Arguably the most iconic symbol of Italian food is the pizza. 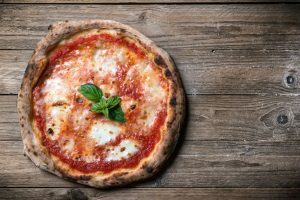 What many may not know is that the modern development of pizza is argued to have originated in Naples after poor locals began using tomato as a topping on their yeast-based flat bread. The dish slowly began gaining popularity in the early 1800s. Most true Italians will argue that there are two different types of pizza — the marinara and the margherita. The ‘marinara’ pizza is a flatbread pizza topped with tomato, oregano, garlic, and extra virgin olive oil. La marinara refers to the seaman’s wife, who is traditionally known as the one to cook and prepare this meal for when her husband returns from the Bay of Naples. The ‘margherita’ is a flatbread pizza topped with a light spread of tomato sauce, mozzarella cheese, and fresh basil. As the story goes, Raffaele Esposito baked several special pizzas for King Umberto I and Queen Margherita of Savoy in 1889 while the two were passing through. 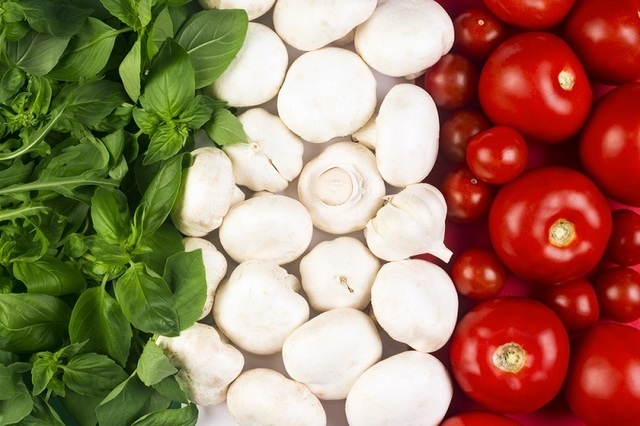 The Queen’s favorite was the one that captured true Italian patriotism, symbolizing the Italian flag. The basil leaves represented the green, the mozzarella was the white, and the tomatoes of course represented the red. In honor of how much Queen Margherita enjoyed this pizza, the creation was named ‘margherita’ pizza. Due to its popularity, pizza can be found on nearly every street in Italy. This doesn’t necessarily mean that every restaurant has great pizza however. The general rule of thumb for ordering pizza in Italy is ‘less is more,’ in terms of toppings. Italians traditionally like more natural flavors and believe that adding more will distract from the true beauty of the meal. When most people think of Italian cooking, steak isn’t usually one of the first traditional Italian foods to come to mind. However, bistecca alla Fiorentina, is actually one of the most famous traditional Italian dishes in the city of Florence. For all the meat lovers out there, this unique dish will make your mouth water. Florentine steak has a very specific preparation. 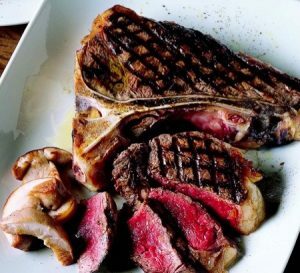 The Porterhouse cut between the sirloin and tenderloin, or the costata, must come solely from the loin near the shoulder of the Chianina cow, which is raised in Tuscany. The 5 centimeter-thick T-bone is cooked for 5 to 7 minutes on each side over a wooden fire until the outside is cooked, while the inside remains a dark red, tender rare. Unlike the pizza, this Italian dish should be exclusively order within the Tuscan region, whether that be in the heart of Florence or more in the countryside. Another unique aspect about this Italian dish, is that it’s meant to be shared. Italians customarily look down upon sharing food, but this 1-2 kg item, they’ll make an exception. One of the best restaurants within the heart of Florence is Ristorante Perseus, located near Piazza della Libertà and Piazza Savonarola. Most people order the steak with a side of the crispy roasted potatoes. 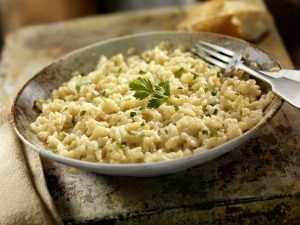 Northern Italy is known for its delicious, creamy rice bowls known as risotto. Arborio and Carnaroli are two of the most common varieties grown in the expansive rice paddies found in Italy. To make risotto, rice is cooked in stock and mixed into a velvety consistency. Sometimes vegetables, seafood, porcini mushrooms, or sausage may be added to intensify flavors. Saffron-infused risotto alla milanese is arguably the most famous type of risotto. This dish is made with meat stock, bone marrow, cheese, and of course, saffron, giving the creamy soup-like meal a yellow tint. If you go to Italy and don’t get at least one or two scoops of gelato a day, did you even enjoy yourself? Like pizza, gelato can be found everywhere in Italy. 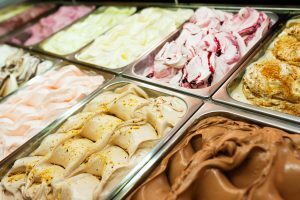 When seeking to find the perfect gelato, however, there are a few things to keep in mind. Look at the material of the containers the gelato is being stored in. If the gelato is in a silver or metal circular container, that usually indicates the gelato is freshly made. True artisan gelato is slowly-churned to ensure an intense flavor and creamy texture. Gelato isn’t made for long-term storage, so stay away from the white or plastic containers. In addition, look at the actual color of the gelato — are they neon or natural tones? If the fruit flavors (strawberry or fragola for example) are in season, they should be bright in color as good gelato is made with real, natural ingredients. If you’d like to try some of these traditional Italian foods right here in Los Angeles, come join us at Spumoni Restaurants! Buon appetito! Our locations are listed below.